No one is going to buy an Apple Watch just to replace her (much cheaper) fitness tracker, but if you shell out $350+ for Apple’s latest device, it needs to perform better than a Fitbit, Jawbone, or Basis Peak. Who’s going to strap two bands to their wrist to count steps? Fortunately the Apple Watch isn’t just a capable health and fitness band: It’s downright amazing, though, like every other facet of the watch, it has room for improvement. Apple Watch’s health and fitness features were what sold me on the watch to begin with, so I had high expectations. I put the device’s native Activity and Workout apps through their paces on outdoor runs and gym workouts during my first week with the watch and plan to fold third-party fitness apps into my regimen down the line. I’ll revisit this in future stories. If you’re a serious athlete, Apple Watch might not be the fitness companion you’re looking for. But the watch is by far the best activity tracker on the market, and it also fits into your life in a way that dedicated fitness trackers simply don’t. The Activity app is a central hub for all of the data the watch collects from your daily movement. The app offers a snapshot of your day in the form of three metrics, Move, Exercise, and Stand. Those metrics are symbolized by three rings, which you can glance at throughout the day to see how close you are to reaching your goals. If you close the rings and they start to overlap, that means you’re killing it activity-wise and can congratulate yourself with many pats on the back. Apple Watch encourages you to move, exercise, and stand up with rings. As the watch starts to learn more about your habits and combines its findings with the data collected by its sensors, its measurements become more accurate. 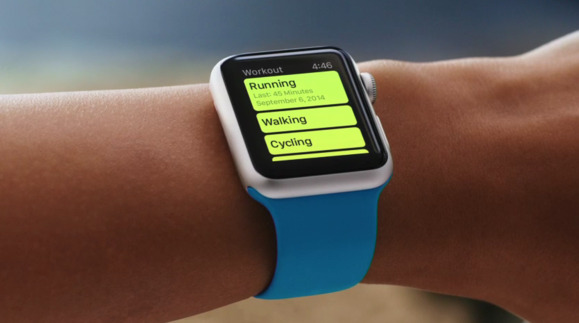 This allows the watch to customize its Move goal for you. When you first open the Activity app on the watch, you have to input some basic info about yourself—age, height, weight, activity level—and then pick your own Move goal, which is calculated in calories. If you’re consistently falling short of your calorie burn goal, or way overshooting it, then the watch will advise you to change it to a more practical goal. The watch’s adaptability also improves its accuracy during times when you don’t have your phone with you. The Stand ring doesn't display the exact number of minutes you were standing versus sitting. Instead, the watch checks that you stood up and moved around for at least a minute every hour, 12 hours a day. But there's no way to tell if you stood one minute or the entire hour, although minutes you're actually moving are still tracked in the Move ring. While you can check out your daily activity progress on your watch, I often catch myself absentmindedly opening the Activity app on my iPhone just to gaze at the large, colorful graphs of my data. How many steps did I take? (Step count is shown in the iPhone app as well as in the watch app when you swipe down from the three-ringed graph.) How many miles did I run? What was my pace per mile? How many calories have I burned? What was my heart rate? My entire being is quantified in blue, pink, and green charts. Just counting steps? Then Activity is enough. But if you want to shift the watch into high gear, open the Workout app on your wrist before you hit the gym (or the road). There are eight different workouts available, which includes the usual suspects like indoor/outdoor running and walking, cycling, and elliptical work, plus an “other” option for tracking things like CrossFit, yoga, and other activities. Those other workouts are tracked as if they were brisk walks, which isn’t ideal, but will hopefully improve in future iterations of the watch’s OS. 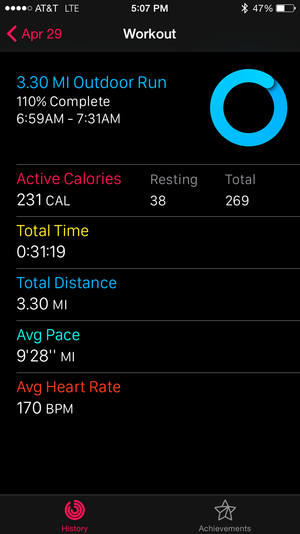 I left my iPhone at home during a run, but the watch still synced my data when I returned. Opening the Workout app puts the watch’s accelerometer and heart rate sensor to work so you get an accurate picture of how intense your exercise is and how many calories you’re burning. This is where the watch really shines: Raise your wrist during a run and immediately see your heart rate, pace per mile, how much time has elapsed, and how close you are to your mileage goal. You can even see all of this data without your iPhone with you. We still need to pit the watch’s heart rate sensor against a chest strap, which is considered the most accurate way to measure heart rate during exercise, so check back for that throwdown in the coming weeks. I found the watch’s heart rate sensor to be a big improvement over other fitness trackers for real-time data. And it will be interesting to see what app developers do with the sensors when Apple opens them up to third parties down the line. Because Apple Watch is so many other things in addition to being a fitness tracker, its health features are a huge bonus instead of its sole reason for existing. That makes it even better. People tend to cast aside their fitness bands when their limited capabilities and tiny displays become annoying, but who’s going to chuck a $350 extension of their iPhone into a drawer to gather dust? Not me.